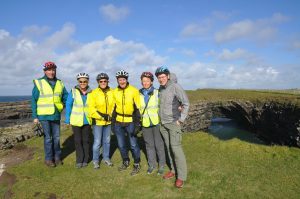 The glorious Loop Head peninsula was our recent cycling destination. 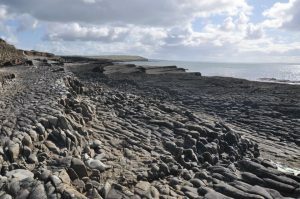 What an extraordinary place – wild and wonderful with the most amazing sea views and geological delights! 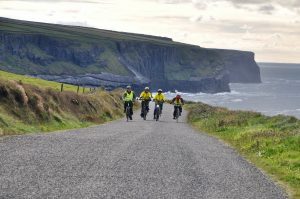 While there weren’t too many hills to challenge our electric bikes, the ability to burn along without worrying about the headwinds was a big advantage in this exposed area that can be (erm!) breezy. 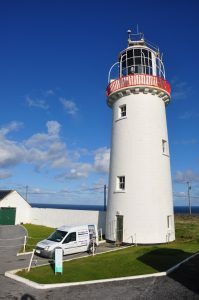 The prominent lighthouse guards the northern side of the mouth of the Shannon, and the peninsula prides itself on having a responsible and sustainable approach to tourism development. Since we parked up our cars on arrival and used our Kalkhoff and Kreidler e-bikes for the whole weekend, we did our bit for its green image. 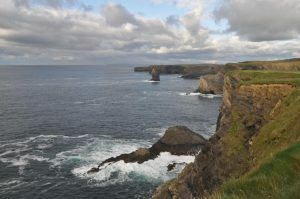 We did three cycles around the peninsula and each corner we turned offered a new breathtaking sight. 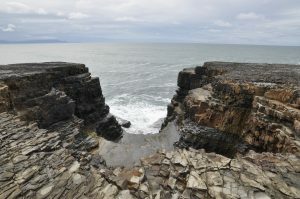 The last Bridge of Ross, a natural arch formed by coastal erosion, is easily accessible. 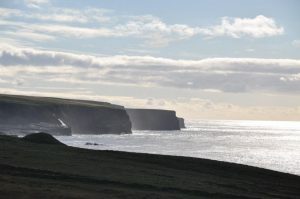 While the cliffs along the northern side of the peninsula may not be as high as the nearby Cliffs of Moher, they are nonetheless spectacular and totally unspoiled. Sea stacks and rolling seas entice you onwards. Rock formations on the southern side of the peninsula would certainly give the Giant’s Causeway a run for its money, while some of you Trekkies may recognise one of these rocky scenes taken near the southern tip, under the watchful gaze of the lighthouse.